Long regarded as a national leader in transportation policy, Portland is being called out by some of the best and brightest for a wrong-headed decision to spend half a billion dollars widening freeways. The damage done is not just to the city’s reputation. Jeff Speck: This is a clear case of State DOTs vs. cites, and humans. If Portland loses, can any of us have hope? It’s remarkable. In just the past couple of weeks, many of the nation’s most widely recognized and authoritative leaders on transportation policy have taken note of plans unfolding in Portland to spend $500 million to widen a mile-long stretch of the Interstate 5 freeway opposite downtown Portland. From these leaders, there’s a sense of shocked disbelief and dismay, that in the face of an increasingly dire climate crisis, Portland is squandering money of freeway widening. 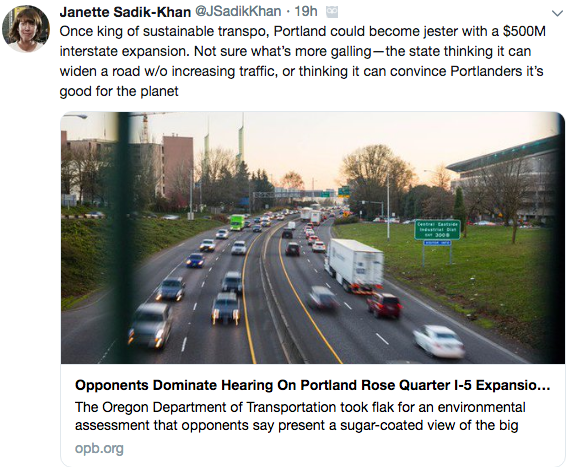 Here’s Janette Sadik-Khan–pioneering transportation director under New York Mayor Michael Bloomberg, and founder of the National Association of City Transportation Officials, and author of StreetFight–had a visceral reaction when she read about Portland’s Rose Quarter freeway widening project. Right now, too many transportation investments take us further away from a carbon neutral world, rather than closer. We need to stop investing in new automobile infrastructure and put that money into improving the quality and service of more efficient ways of travel, such as public transit and segregated bike lanes. Not only have these been typically underinvested in, the investments that have been made are not commensurate with the fraction of travel that should be made by these means. Chase followed up with City Observatory by email to lend her thoughts on the Rose Quarter project. Portland’s planned investment in highway widening is pointless, counterproductive, and a misuse of funds. We’ve learned and proven again and again that highway widening induces demand and is therefore provides just short-term relief. Just at the moment when we need to reduce carbon emissions and especially in the challenging transport sector, this investment would increase vehicle miles travelled and emissions. That said, the timing of this scale of investment in transport infrastructure could not be better if it were strategically invested in ways to reduce car dependency, reduce fuel use, and improve the quality and reach of more efficient modes. 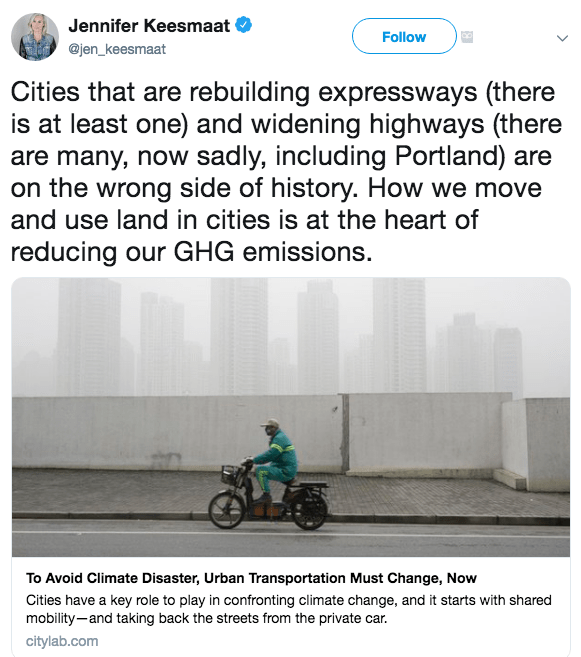 The data are clear: if Portland wants to worsen its air quality, crash mortality rate, traffic congestion, carbon footprint, and inner-city property values, it should plow right ahead with the I-5 expansion. Once again, this is a clear case of State DOTs vs. cites, and humans. If Portland loses, can any of us have hope? Brent Toderian, former planning director for Calgary and Vancouver, added his voice. Big, over-engineered road projects waste precious funds, generate more driving and more pollution, and prioritize high-speed vehicle travel over the safety of every other road user. The Portland City Council voted in July  to kill the freeway. The victory did more than stop one road from tearing up quiet residential streets. Light rail became the region’s primary answer for transportation. Neighborhood associations emerged as the power blocs of Portland politics. Most of all, the victory over the Mount Hood Freeway created the story of Portland exceptionalism, and the fight helped define us as an urban model for the nation. The heady days following the freeway’s death gave many at City Hall the conviction there was more that could be done, that a progressive movement was about to overtake a stodgy Portland. It’s been a leader in urbanism and bike transportation. But arguably, the city may be coasting, drawing on the fading glamor of past successes, and with little appetite or courage for aggressive leadership in what is decidedly a more serious situation. As Brent Toderian has wisely observed,“The truth about a city’s aspirations isn’t found in its vision, it’s in its budget.“ The $500 million I-5 Rose Quarter Freeway widening project is the largest single transportation investment currently on offer for the Portland’s central city. Spending that much to make car movement easier makes a mockery of stated city and state goals to reduce carbon emissions–even as the state’s Global Warming Commission points out that the state is losing ground in its adopted goal to reduce carbon emissions to 20 percent of 1990 levels by 2040, solely due to the recent increase in driving. 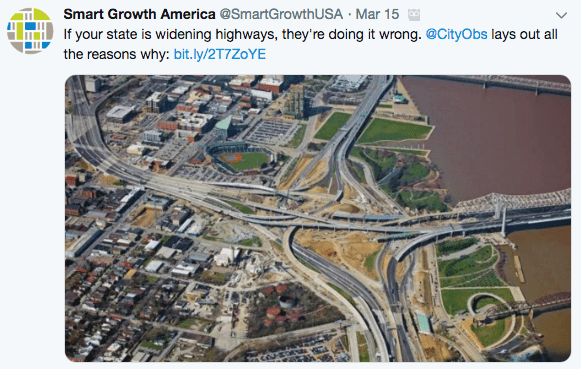 Ultimately, this isn’t about losing credibility with transportation thought leaders and think tanks–though we should ponder their warnings carefully. It’s really about who we are as a city. In the face of the most serious environmental crisis we’ve ever experienced, we can’t align our spending choices with our stated values, maybe we’re not the place we thought we were, or the place we say we want to be. Editors Note: This commentary has been revised to include comments from David Roberts and Jeff Speck.